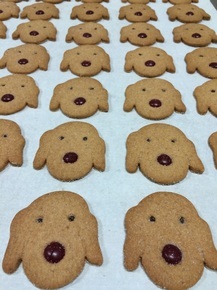 Habey’s HOUNDS are vanilla bean shortbread cookies partially sweetened by natural date sugar, which enhances their flavor and texture. The mini-chip eyes and classic M&M’s® noses add tasty bites of chocolate. I created Habey's HOUNDS in 2012 at the request of my old friend Richard Cohen, to celebrate the launch of his book I Want to Kill the Dog. The canine target of Richard’s playful ire is Jasper, the beloved pet of his celebrity wife, Meredith Vieira. 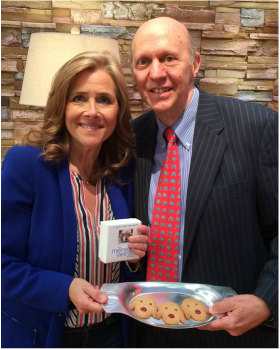 Jasper was the model for the cookie – and two years later when “The Meredith Vieira Show” premiered on NBC Daytime, Meredith chose to give Habey’s HOUNDS to all of her designated guests. The tradition continued throughout the run of the show. I dedicate Habey's HOUNDS to Richard and Meredith for their support — and to Daisy and Kingston Haber-Mason, the family Springer Spaniels who keep Aaron Mason and me on our toes! 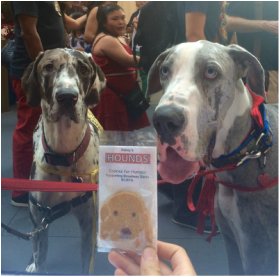 ​For every nine-ounce box of Habey's HOUNDS sold in the US, SHOW COOKIES will donate seven and a half cents to Broadway Barks, a pet-related charity that promotes the adoption of shelter animals. Broadway Barks was founded by Bernadette Peters and Mary Tyler Moore in 1999 and is affiliated with Broadway Cares/Equity Fights Aids. Habey's HOUNDS Ingredients include unbleached flour, butter, sugar, Nielsen-Massey vanilla, natural date sugar, bourbon, chocolate, cocoa butter, milkfat, skim milk, soy lecithin, flavorings, coloring and sea salt.